Winter is finally starting to let up over here in Toronto. There are still a few patches of snow here and there but for the most part the weather is warming up and I can finally stop wearing my heavy winter boots! This winter has been the longest and coldest I can remember in a long time. Ice storms, -40˚C days, and countless extreme cold weather warnings. This past Christmas we dealt with about a week of power outages across the city. Mine lasted from the night of my Birthday up until the day after Christmas. I sadly remember sitting in a slump in my frozen living room, wearing 5 layers of clothing, on Christmas day crying “This is the worst Christmas ever, I hate Rob Ford”. Yeah, I blame it on Rob Ford. So, to be honest, I don’t think I have ever been so excited for summer to come. With its hot days, going to the beach, walking around Toronto’s different neighbourhoods, biking around the island, sitting out on patios, going to farmer’s markets, and hopefully some gardening. That is what I’m looking forward to this summer. But for now, since it is still a little chilly outside, I like to warm up with some tea or coffee and something warm to eat. 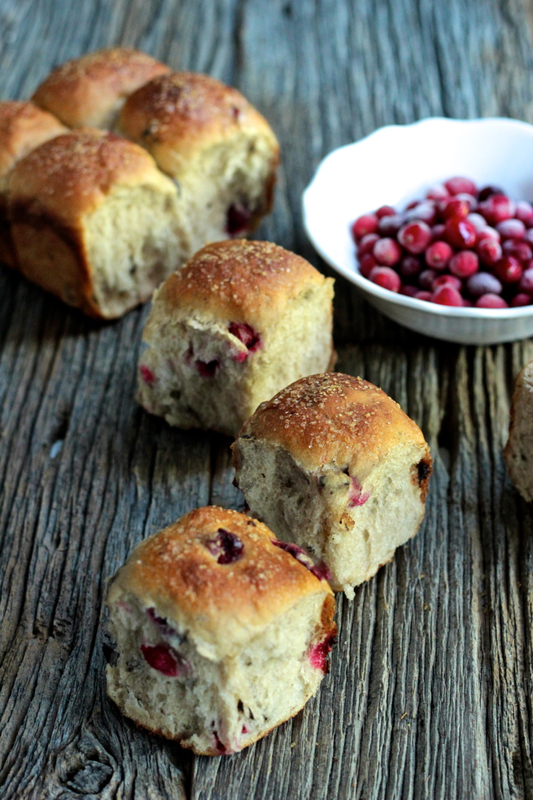 These buns are a nice way to use up some frozen cranberries that most people have lying around after their winter season. 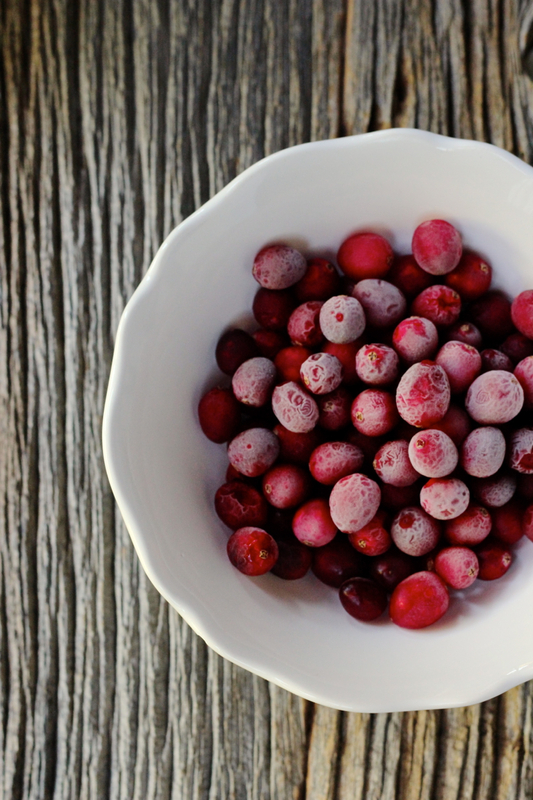 The combination of tart cranberries and the sweet dark chocolate makes for a nice contrast. This recipe comes from one of my all time favourite books: Home Baking by Jeffrey Alford and Naomi Duguid. It is a wonderful book that I was lucky enough to get for half price about 10 years ago in a small book shop in downtown Toronto. It is filled with wonderful recipes for buns, bread, tarts, cakes, and small pastries from their travels around the world. As well, each recipe comes with its own story from their travels or interesting backgrounds of where the food came from. It’s probably one of my favourite books just because of that. Who doesn’t love to read stories about the food they’re just about to make? However, I did not follow the recipe exactly but instead made these little buns vegan by swapping the dairy products for vegan alternatives and omitting the egg from the original recipe. They’re just as delicious as the originals but maybe just a little bit better for the world. Lightly grease one 9×5 inch loaf pan with vegan margarine. In a large bowl or bowl of a stand mixer, pour in warm almond milk and stir in yeast. Let stand for about 10 minutes. Stir in 1/2 cup of the flour. Add margarine, in pieces, sugar, and salt and stir to incorporate. Add 1 more cup of flour and stir in until fully incorporated. Now add in the chilled chocolate and cranberries with 1/4 cup more flour. Mix until incorporated. If not using a stand mixer, turn out onto a very well floured surface an knead gently, incorporate more flour until the dough is only slightly sticky. If using a stand mixer, just follow the kneading process and incorporate more flour until it is only slightly sticky. Place dough into a bowl and cover with a clean cloth or plastic wrap and let rise until doubled, about 1 1/2 hours. Once risen, turn dough out onto a lightly floured surface and gently punch down. Cut into 8 equal sized pieces. Lightly grease the palm of your hand and roll each piece into a ball. Place each ball beside each other into the greased loaf pan. Cover the pan with a cloth or plastic wrap and let rise for about 30 minutes while you preheat your oven. Preheat oven to 400˚F and place rack in the middle. 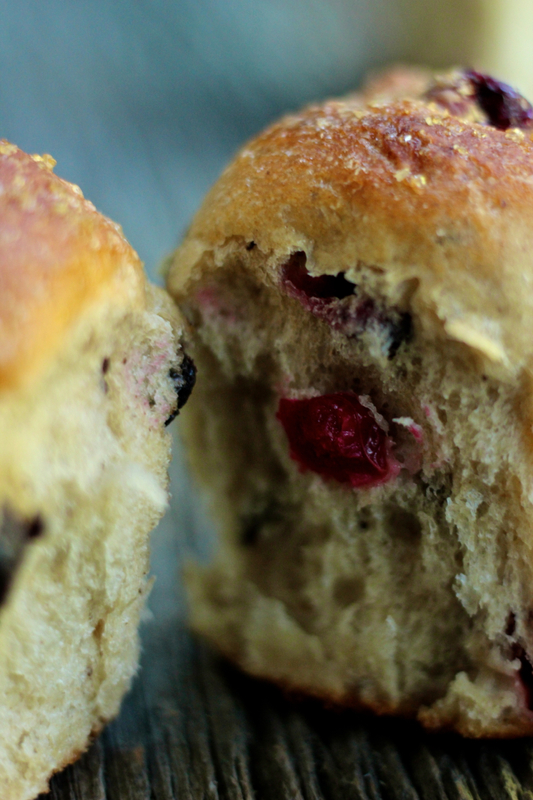 Once buns have risen, lightly brush with almond milk or melted margarine and sprinkle with coarse sugar. Bake for 30 to 40 minutes until golden brown. Immediately remove from the pan and cool on a wire rack.